A report from Hackney Independent on the recent protests at Broadway Market. Most people in Hackney have heard about the protests going on in Broadway Market over the last three months. Since November members of the local community have been occupying Francesca's Cafe and held many protests and public meetings and generated nationwide interest in the campaign. The focus has been on two longstanding businesses which have been at the mercy of property developers looking to cash in on the gentrification of Broadway Market - Tony Platia was evicted from the cafe he has run for 31 years and Lowell 'Spirit' Grant has been threatened with the same treatment. Tony & Spirit are popular local figures who ran shops used by local working people who can't afford to use the new boutiques and upmarket cafes that have sprung up in Broadway Market. Their situation is the consequence of Hackney Council's pro-big business policies - over the last decade the council has been selling off its commercial properties to rich investors at knock down prices often leaving long term leaseholders in the lurch. The effects of this can also be seen across South Hackney as former public buildings suddenly become yuppie flats. Hackney Independent are proud to have been part of the protests, working side by side with a diverse group of locals to fight for justice for Tony and Spirit. We see the Battle for Broadway Market as part of a broader fight against the processes of gentrification and 'Regeneration' which have had a disastrous impact on the lives of working class people in Hackney. Most people in Hackney feel pretty disillusioned by mainstream politics. The dismal turnouts at elections show how far removed the major parties are from the reality of people's lives. 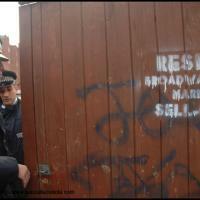 What has happened in Broadway Market over the last three months has re-awakened many people's interest in local issues. This is because events have been led entirely by residents who have had enough of the empty promises coming from Hackney Town Hall and taken matters into their own hands. What has been achieved has demonstrated the power of independent action. The Occupation of Tony's Café captured the imagination of the press and has been reported in most newspapers in the UK as well as in many other countries. Locals also organised two public meetings where Councillors were exposed to people's anger about the sell-offs in Broadway Market. These well attended, highly charged events were a long way from the meaningless 'consultation' sessions that New Labour love to talk about. As we go to press popular pressure has forced Hackney Council to re-open investigations into its commercial property sales and it looks more and more likely that Spirit will win a court appeal to stay in his shop and home. Tony's Cafe has been evicted once more but protesters have vowed to continue putting pressure on the developer and have already leafleted his home village in Kent. What's been clear is that local people have been setting the political agenda. Tory Councillor Boff has been openly supporting the campaign and seems keen on photo opportunities. To his credit he shows more concern for locals than Labour but his party subscribe to the same free-market principles that are tearing our area apart. It is easy to be critical when you are in opposition. New Labour are even worse. Initially they showed no willingness to find a solution for Tony or Spirit but are now publishing pre-election material that claims they have supported the campaign all along. What a lie! This is battle has been waged by the people for the people. Who is Involved with the Protest? What's been unique about the occupation of Tony's Cafe is that ordinary working people have been central to its success - not just the 'activist' types usually associated with this kind of protest. We spoke to some people involved about what moved them to act. "I've lived in Hackney all my life. Tony's was a place I used around here. Loads of pensioners liked using the place. Tony was pushed out as he didn't fit in with the 'new' Broadway Market. I've made real friends in this group who are working together for something they believe in." "Before I just existed where ever I was and not been conscious of what's been going on around me. This has expanded my social awareness and I've made so many new friends in the area. It's also been a great experience, fighting against property development and corruption. I've never been involved with anything like this before". was enough and it was time that people took a stand against the developers and the council. It's been brilliant and we've been amazed by what we accomplished"
"This is where I was born, I've seen the changes going around. People have come in and taken over everything and local people are moving out. My family has been pushed out right and left. What those people did to Tony & Spirit is totally out of order. If all of us had got together in the first place this would never have happened. If you don't like whats happening around you have to stand up and be counted. It's been nice to see those responsible having to look over their shoulders as everyday people take over"